“Anchor,” yes, the vision of strong and rooted. Thanks, Hy. Such a beautiful and touching description of the “grey lady,” and how important and effective this tree has been in your life! She comforts you, and even helped you feel grounded when you retired. She’s always present for you to relate to. What a nourishing friendship! Yes, and so reliable in every season. Quite remarkable, right in my back yard! Thanks, Bev! I like the writer’s calm exultation in this piece, and its near-contemplative tone. 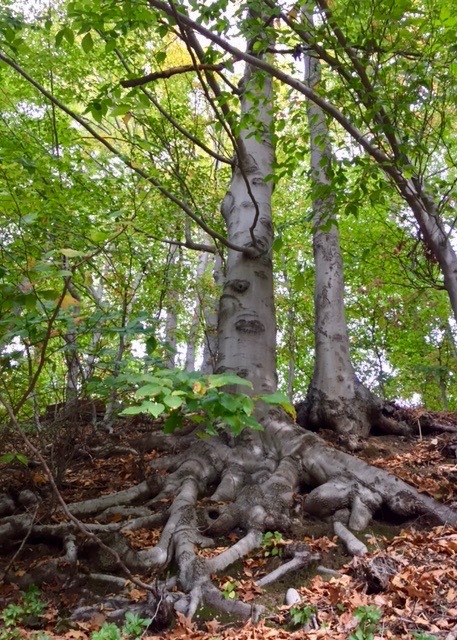 I especially like the image of an American beech tree as a strong, nurturing presence: like a good mother, or teacher…or national leader. Rosemary, would that the attributes of my “grey lady” fulfill the promise of our next national leader. Thank you, Faye. Another great read. Thanks for reading and commenting, Russ. I really appreciate it. Much appreciation and thanks, Kat! Yes, I love the imagery of stretch, which is what we are all required to do post election!